Home / Peterson Institute / How Worrying Is the Recent Downgrading of German Growth Forecasts? Growth in Germany has been very weak since the third quarter of 2018. The reason is a combination of one-off factors, including a drought and a new EU emissions testing procedure, which held back car sales last year, as well as cooling demand for German exports. As a result, growth projections for 2019 have been steadily downgraded, contributing to a sense of gloom. But observers of the German economy should not worry too much about the recent downgrades in growth forecasts, because these do not, in fact, imply pessimism about the future. They merely reflect the slowdown that has already happened, not expectations that the slowdown will continue. Consider the most pessimistic of the recent forecasts—the Spring 2019 forecast by the Munich-based Ifo Institute, published on March 14, 2019. Growth in Germany has been very weak since the third quarter of 2018. The reason is a combination of one-off factors, including a drought and a new EU emissions testing procedure, which held back car sales last year, as well as cooling demand for German exports. As a result, growth projections for 2019 have been steadily downgraded, contributing to a sense of gloom. But observers of the German economy should not worry too much about the recent downgrades in growth forecasts, because these do not, in fact, imply pessimism about the future. They merely reflect the slowdown that has already happened, not expectations that the slowdown will continue. Consider the most pessimistic of the recent forecasts—the Spring 2019 forecast by the Munich-based Ifo Institute, published on March 14, 2019. The Ifo is now forecasting growth of about 0.6 percent for Germany in 2019, down from 1.1 percent in its Winter 2018 forecast published in December, which itself was a large downgrade from its Autumn 2018 forecast of 1.9 percent published in September. The main trigger of the latest downgrade is a fall in industrial production in January 2019, reported on March 11. This was indeed bad news. But Ifo expects growth to rebound in the second quarter and remain strong. Ifo’s downward revision for 2019 is driven entirely by the expectation that growth in the first quarter of 2019 will turn out worse than expected in December. Table 1 illustrates this. The first row shows the Ifo forecast of December 2018. The first three quarters in 2018 were known outcomes at that point. Ifo assumed that there would be a partial recovery in the last quarter of 2018 and a full recovery in the first quarter of 2019. In fact, actual growth was zero in the fourth quarter of 2018 and is expected to be around 0.1 percent in the first quarter of 2019. The second row of the table shows that changing just these two numbers, without making any other revisions to the path that Ifo forecast in December, is enough to lower the Ifo forecast for 2019 from 1.1 percent to its current forecast of 0.6 percent (small differences are attributable to rounding). Ifo did in fact change its path for the rest of 2019 but not by very much (see third row), assuming a slightly gentler rebound but a higher end-year growth number. Hence, what we should take away from the new Ifo forecast is not that the German economy has continued to stagnate—which we already knew when the industrial production numbers for January came out—but that Ifo is forecasting a quick recovery. That is good news. The question, of course, is whether Ifo is right. The pattern of the last two forecast rounds may repeat itself. The rebound, currently forecast for the second quarter of 2019, may not happen. The last row shows what would happen if the rebound that Ifo is forecasting is delayed by just one quarter. Average growth in 2019 would end up in the low decimal range. Why is Ifo so sure that the German economy will turn around next quarter? In the statement accompanying its forecast, Ifo says that the German economy “is likely to grow again somewhat more strongly than in the second half of 2018, as the production difficulties of German industry are likely to be gradually overcome,” domestic drivers are still intact, and strong wage increases as well as fiscal expansion are in the pipeline. The institute also says that its forecast assumes no further escalation of trade conflicts, an orderly Brexit, and no debt crisis in Italy. All these assumptions are reasonable. But even if they are right, the average growth projection for 2019 remains extremely sensitive to the timing assumed for the recovery, which is notoriously difficult to predict. If the recovery expected by the Ifo Institute and others is delayed, the actual growth number for 2019 may turn out even lower than 0.6 percent. But far more important than the precise timing of the recovery is whether the basic story justifying expectations of a recovery will turn out to be true—namely, that robust domestic demand in Germany, helped by some fiscal stimulus, will withstand negative external shocks. 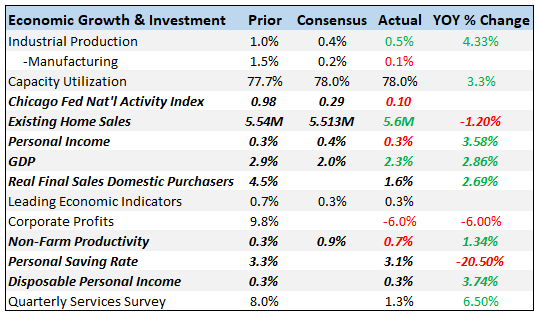 To see if this is the case, observers should be looking out for weaknesses in employment, services, and domestic sales rather than declining growth forecasts that reflect weak industrial production. Previous Why Are German Centrists Cozying Up to Hungary’s Orban?